Le Mazarine, on the street named after the infamous Cardinal Mazarin, who educated the young King Louis XIV in the ways of the crown, is known for its Art Galeries, Chic Boutiques, Food Specialty stores, and its proximity to the famous, and always interesting Rue Buci, the Place Odéon and the Romantic Pont des Arts bridge, with the thousands of inscribed pad locks left by lovers from around the Globe. As you enter the 16th Century building, protected by Paris' Historic Society, you'll feel like you've stepped back in time, with its cobble stoned courtyard and wood framed buildings. The stairwell has original rod iron details, exposed stone and wood framing. The apartment is unique, once owned by an actor from the Comédie Francaise, with an opened plan, loft style floor plan. You'll head up 1 flight of stairs, pass through a corridor, and then up 2 more flights to your Paris Haven. It has a modern feel, but with warm lines, natural wood details, and clever modular features. There are 4 windows, 2 looking over the enclosed quiet courtyard, and 2 double windows over the quaint Rue Mazarine. You'll first pass by the open planned kitchen, with a window over the courtyard, plenty of counter space and fully equipped with a dishwasher, 4 burner electric cook-top, drip coffer maker, toaster, and all the utensils needed to make your own gourmet meals with the fresh ingredients found in the grocery store just across the street, 1 minute from the apartment. There's a clothes washer/dryer combo machine, also a rack for drying clothes, and iron and ironing board as well. The living area, with its double window, has built in features, that can be adapted for various uses, like the couch with storage under the cushions, the expansive dining table, that can be extended, and the dish cupboard, that can be rotated to open in either the kitchen or the dining area. The bedroom can be seen from the living room via an open wood barrier, allowing light from both windows throughout the apartment, but there is a wood panel that slides, to isolate the living area when necessary. The bedroom has a Queen sized bed (160x200cm) and another double window with plenty of light. The clothes storage area is deep, and there's room to place luggage on top. The second bedroom, with a large window over the courtyard (equipped with an electric shutter), has two bunk beds (90x200cm) - being suitable for 2 children - or for 1 adult only on the bottom bunk - the top bunk is not suitable for an adult. The bathroom, between the bedrooms, has a sink, and walk in shower (the toilet is separate, in the entry way). The bathroom has curtains each side, to separate it from the bedrooms. The apartment is equipped with flat screen TV, WiFi, Cable TV, and Free International phone calls. The apartment is unique, decorated with a retro feel, but with modern, comfortable features. 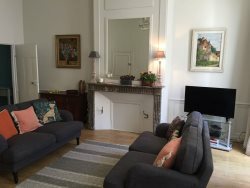 It's location is spectacular, with proximity to the Seine, the Latin Quarter, St Germain area, and the Jardin de Luxembourg. Le Mazarine, which is close to transportation, food stores, restaurants, Jazz clubs, chic shops, and in the heart of one of the most sought after neighborhoods, is a perfect chez-vous in Paris!